Art classes in Scotland began at an early age and, from crayons in kindergarten to water colors in high school, the tone seldom varied. “Color within the lines” was the order of my first day (and any other day) at the age of five. Although these words were not exactly designed to set free the spirit of creativity, the well-intentioned discipline of those early years stood me in good stead later on when I ventured into the challenging world of egg tempera painting. I became hooked on egg tempera after viewing a small painting in a local gallery. This ancient medium was used in the fourteenth and fifteenth centuries and produces a finish like no other medium. Even the most subtle colors shimmer and glow with light. It is an ideal medium for realism, producing delicate light and shadow areas as well as translucent flesh tones. Apart from working with this highly rewarding medium, and unlike those early school days, my greatest challenge now is painting “outside” the lines. For me, this is capturing the unseen elements that breath life into a painting, such as a sense of the character or personality of the subject, or the pervasive mood and atmosphere of each scene. Ella (McCutcheon) Frazer was born and educated in Scotland. Traveling in Europe for years gave her the opportunity to visit the many galleries and museums with their wealth of ancient works of art. This exposure was instrumental in her later studies in ancient art and architecture, particularly in the materials and techniques of the old masters. She also concentrated on portraiture and figurative work at this time, studying egg tempera, oil, and acrylic paints, and also silverpoint drawing. She later received a BA in Fine Art from the University of Toronto and has now settled in Florida. 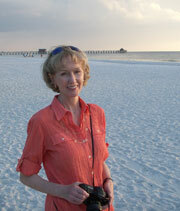 Her work has been exhibited in Toronto, Barrie, Owen Sound, and Bermuda. Most recent exhibitions include the Portrait Society of Canada’s “A Portrait: The Face We Present to the World” and “The Canadian Portrait: Today and Tomorrow”; The American Artists Professional League's, 2010 Eighty-Second Grand National Exhibition in New York; and a feature in the Journal of the Portrait Society of America’s Member Gallery. All images and text on this website are copyrighted © by Ella Frazer. All rights reserved. For authorization to reproduce any of the images or text, please contact the artist.